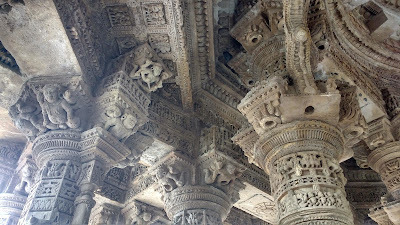 The Solanki Dynasty of Gujarat has left behind a sample set of amazing architecture. 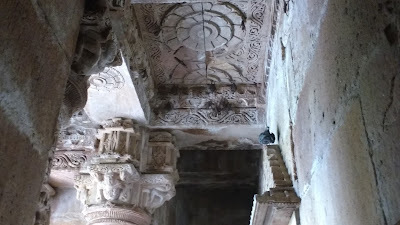 The Rani Ki Vav of Patan has already made it to the World Heritage Site list. 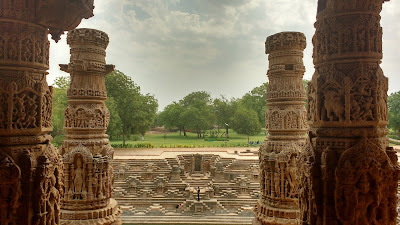 The Sun Temple of Modhera, artistically and in scale, is not far behind too. 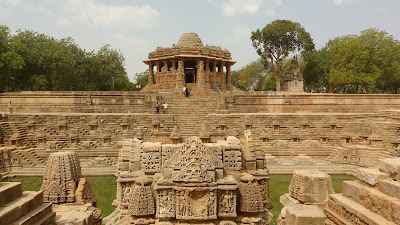 The monument has three sub-structures: the Kund (stepped-pond), the Sabhamandap (assembly-hall) and the Gudhamandap (sanctum). 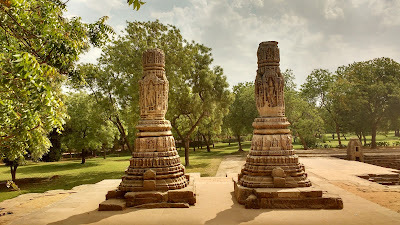 The structures are aligned in perfect symmetry in the east-west direction. 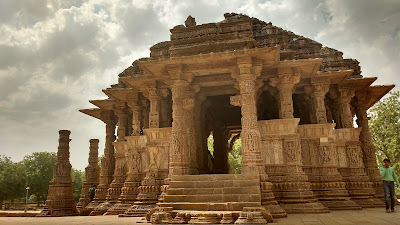 The construction of this temple, located by the banks of the river Pushpavati, is attributed to King Bhimdev (1) Solanki from the early 11th century. 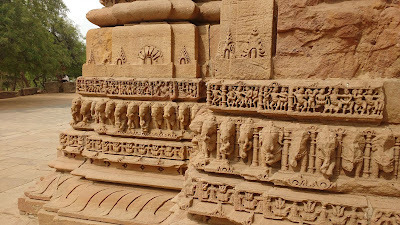 The temple was damaged during the raids of Mahmud Ghazni. As of today, the temple is just a monument devoid of actual worship. A smaller, modern temple exists next to the Sabhamandap where the worship is now practiced. 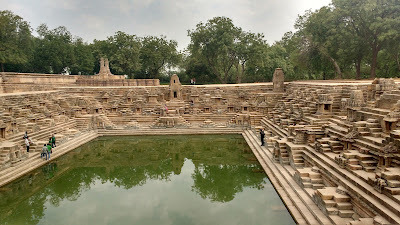 The Kund is the first structure that one sees after entering the complex gates. 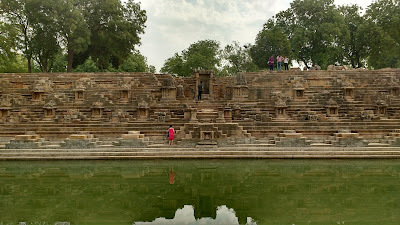 The structure is rectangular with stone steps leading down to the water level. 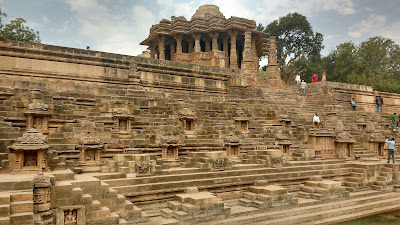 The steps are punctuated regularly by shrines of various sizes dedicated to multiple gods pertaining to the Hindu mythos. 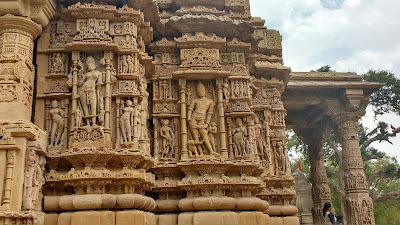 The Sabhamandap is artistically the most intricate of the three main structures in the campus. 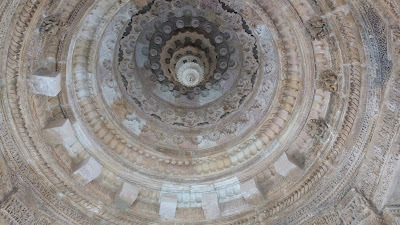 The structure is approached via the western steps of the Kund, passing between two elaborate coloumns of an erstwhile Toran. 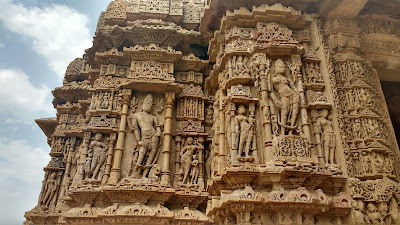 The inner structure has ornate pillars with sculptures of amorous couples and divine beings. 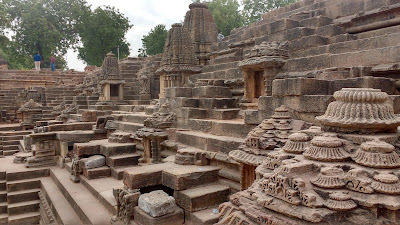 The Sabhamandap has free access from all four sides, with the eastern and western sides opening to the Kund and the Gudhamandap respectively. 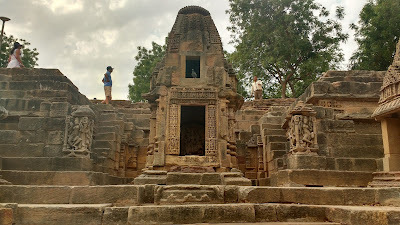 The Gudhamandap used to be the main shrine at the complex. 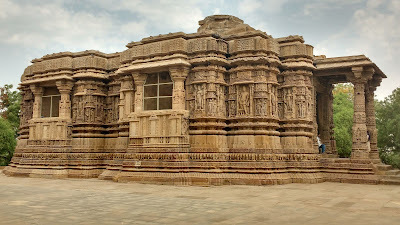 The structure is a bit longer than the Sabhamandap and internally divided into two sections: the outer hall and the inner sanctum. The inner sanctum is is surrounded by an ambulatory path. The sanctum is empty and hence sealed off. The ambulatory path is infested with bats - the stench will put you off from any misadventure anyway. Nonetheless, the structure is impressive. 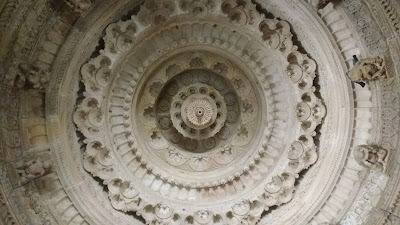 The area near the main structures has another Toran pair of intricate coloumns and a small step-well. 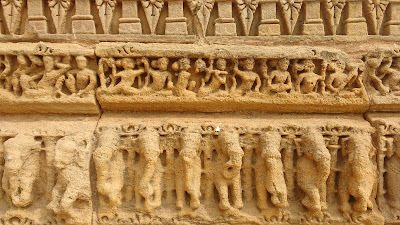 The Toran is probably the remains of a secondary shrine. 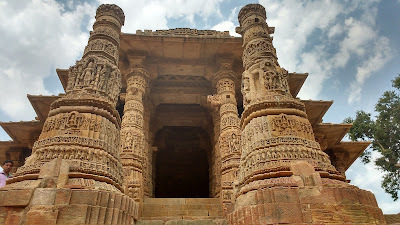 In order to visit Modhera, Mehsana is the closest rail and road head. 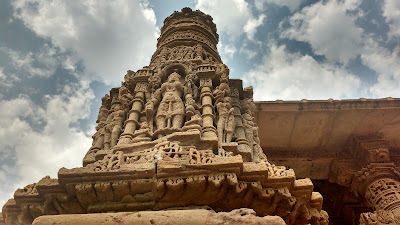 Mehsana is well connected to Ahmedabad, Mumbai and Mount Abu in Rajasthan. One can easily cover Patan, Siddhpur and Vadnagar nearby.